The plot's finer points might seem familiar to those older readers I just mentioned: a mysterious supernatural entity, long held in check by local mystics, has broken free and cut a swath of carnage through the heart of Mumbai. If you guessed the name of the only man in the world who can help, you get a gold star. It's familiar territory for old John, who actually dealt with something very similar in his very first story arc some two hundred sixty issues back. Milligan does enough differently this time around to grant the story the fresh modern edge it needs, but this isn't exactly fresh ground. It's written well enough, with perhaps fewer appearances from the headliner than I'd like, but it's nothing groundbreaking, won't promise to turn the character on his head or anything like that. It's good, but it's very safe. Giuseppe Camuncoli delivers another nice showing with this issue's visuals. If you're a cross-publisher reader, you might remember Camuncoli's recent work from Dark Wolverine or Incredible Hulk, which is where he made an impression on me. Camuncoli is no stranger to the Vertigo concept, though, nor is he a rookie on Hellblazer. With more than a dozen Constantine-centric issues to his credit, this actually represents something of a homecoming for the Italian artist, and he really makes it shine. 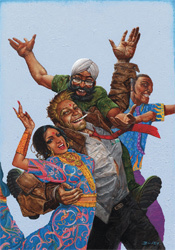 Camuncoli's nationality may not match the Indian setting of the story itself, but the faintly exotic, unconventional style of his artwork does provide a nice partner for the story's international scenery. He peppers the issue's crowded backdrops with adaptations of Bollywood movie posters, filthy strip mall marquees and pushcart vendors, but the artwork, strangely enough, never gets overcrowded. Giuseppe primarily deals with sharp restraint and subtlety, but his illustrations are trembling with life and rich with atmosphere. There's no uncertainty in his work, just like there's no question he's got a bright future ahead of him. Vertigo is probably a better home for his technique than a mainstream Marvel superhero book, but he can pull off either style when necessary. I lost interest in this series when it embraced weirdness for weirdness' sake and lost sight of any sort of underlying plot threads or historical significance. That was about six years ago, and I think it's had plenty of time for a fresh start. Despite a somewhat light touch, the current iteration is a big improvement from where I'd left it. It's well written, with knowledge and respect for the source material, and the artwork is gorgeous. Hellblazer isn't about to make a return appearance on my pull list, but it's on the right track. Borrow it.